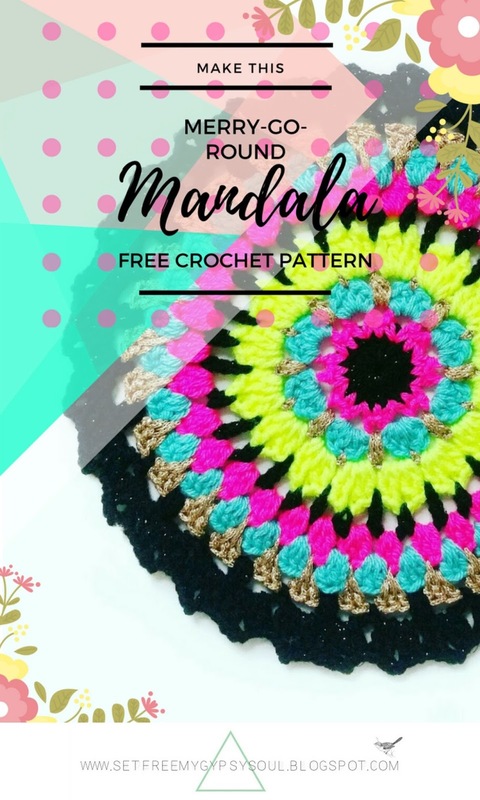 Make this sweet floral centered crochet mandala using a quick and easy combination of trebles (US dc), puff stitches and chains with this week's free Monday Mandala crochet pattern. 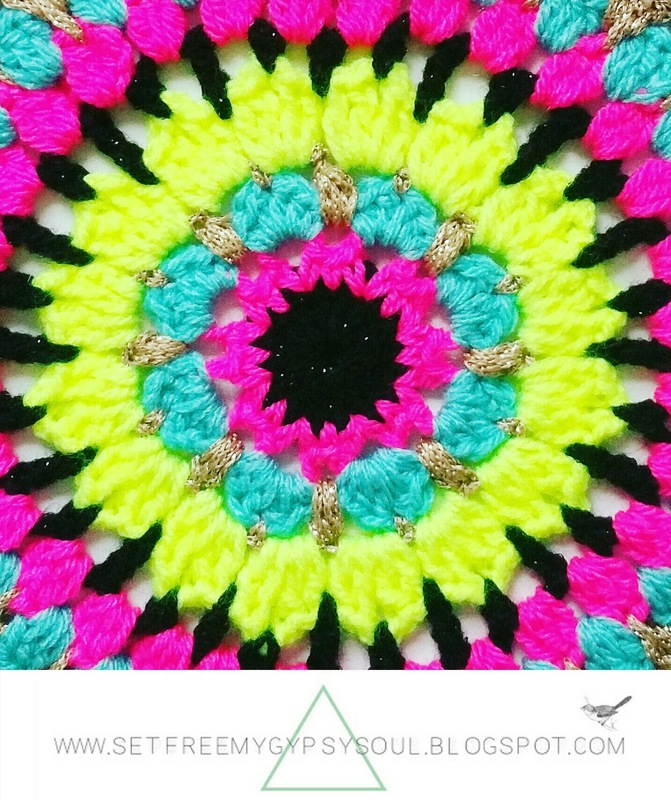 Mixed with the soft Stylecraft DK in Aspen and Fiesta, a colour-pop of Neon (of course!) 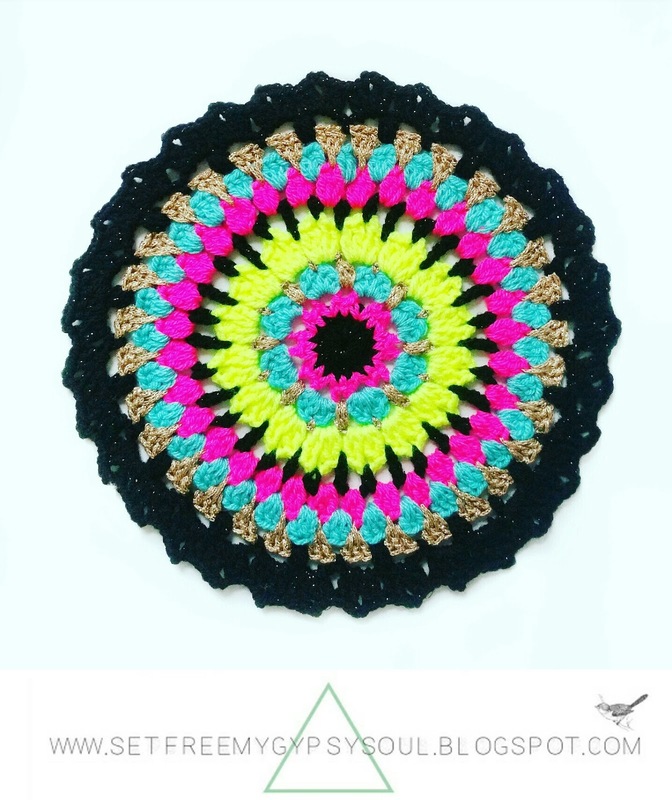 and some black glitter yarn in this mandala it adds the perfect little touch of Luxe to this quick and easy to work up crochet project. 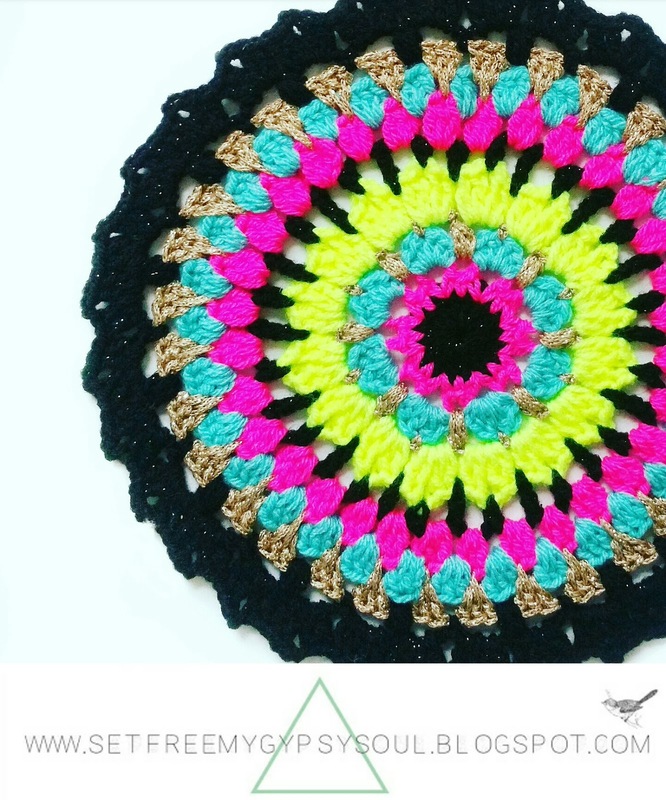 This mandala pattern uses a simple combination of only treble crochet (US dc) stitches, chains, dc (US sc) and some 3 y/o puff stitches but really pops! 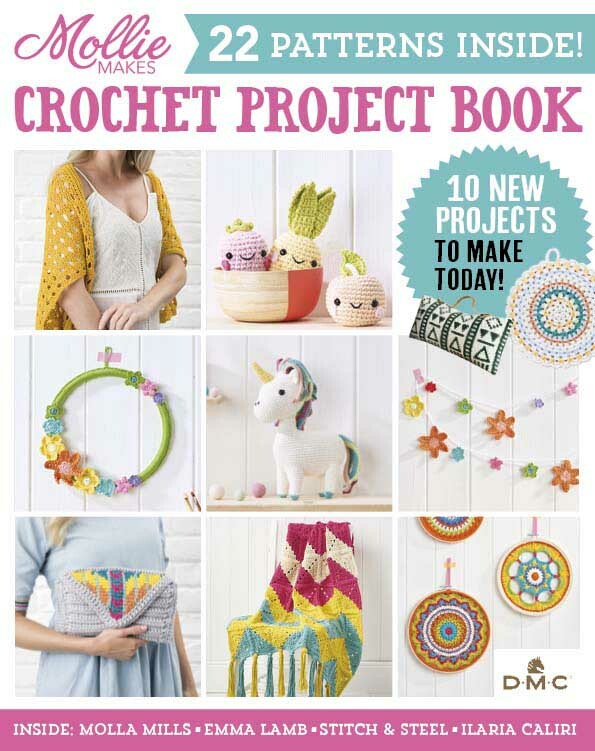 It's a great one for beginners to practise their stitches and more experienced fibre-artists to get some instant crochet craft gratification! Big thankyou to gorgeous Ale of Homemade at My Place and Julie at Mei Gui Designs for helping me to name this one! 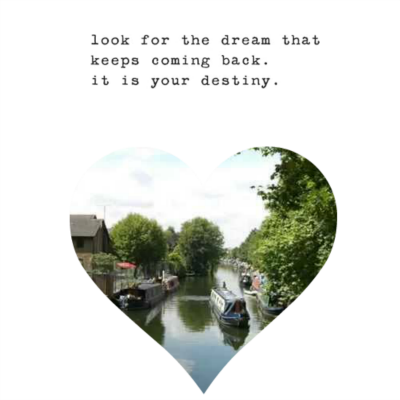 Be sure to check out Ale's blog and Instagram by clicking here and here, and Julie's Instagram and Etsy shop by clicking here and here. 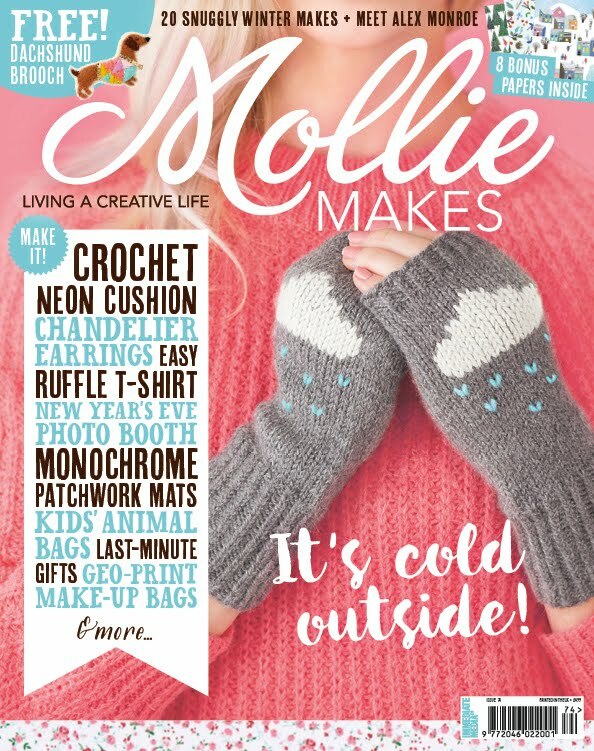 This one is made using a 4.5 mm hook and DK yarns and measures approx. 8 inches across. Round 1: Start with a magic loop and ch 3 as 1st tc (US dc). 15 tc (US dc) into the loop. Join with slip stitch and cast off. 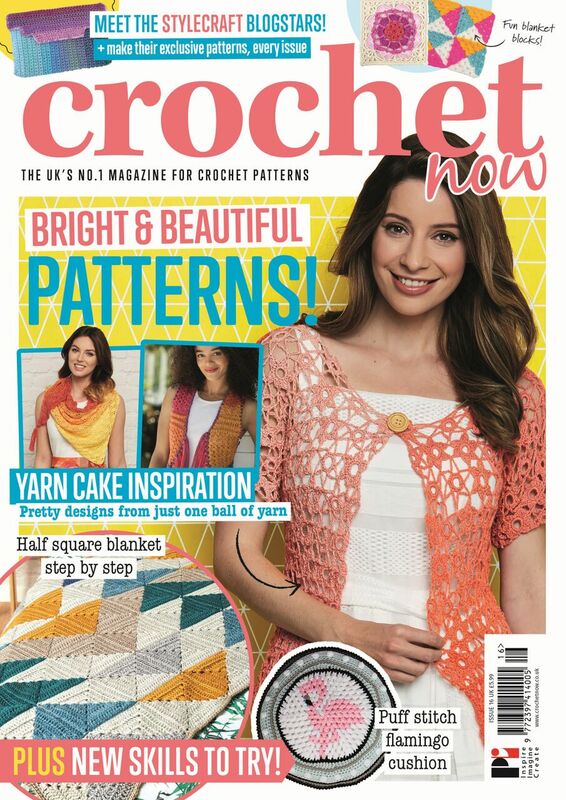 Round 2: Cast on into any ch space between tc (US dc) stitches and ch 1 as 1st dc (US sc). Ch 4 and dc (US sc) back into the same space to form a loop. *Dc (US sc) into the next space. Dc (US sc), ch 4, dc (US sc)* into the next space and repeat * around the work. Join with slip stitch and cast off. Round 3: Cast on into any loop space and ch 1 as 1st dc (US sc) . Now into the loop make 1 htc (US hdc), 2 tc (US dc) , 1 htc (US hdc), and a dc (US sc). Move straight to the next loop and repeat. 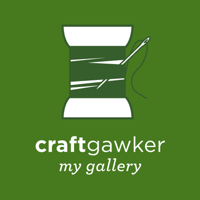 Repeat around the work and join with slip stitch. Cast off. Round 4: Cast on into any space between 2 dc (US sc) stitches of round 3 and make a 3 y/o puff stitch. Ch 2. Skip 2 spaces and dc into the third - between tc's (US dc) from round 3. Ch 2. 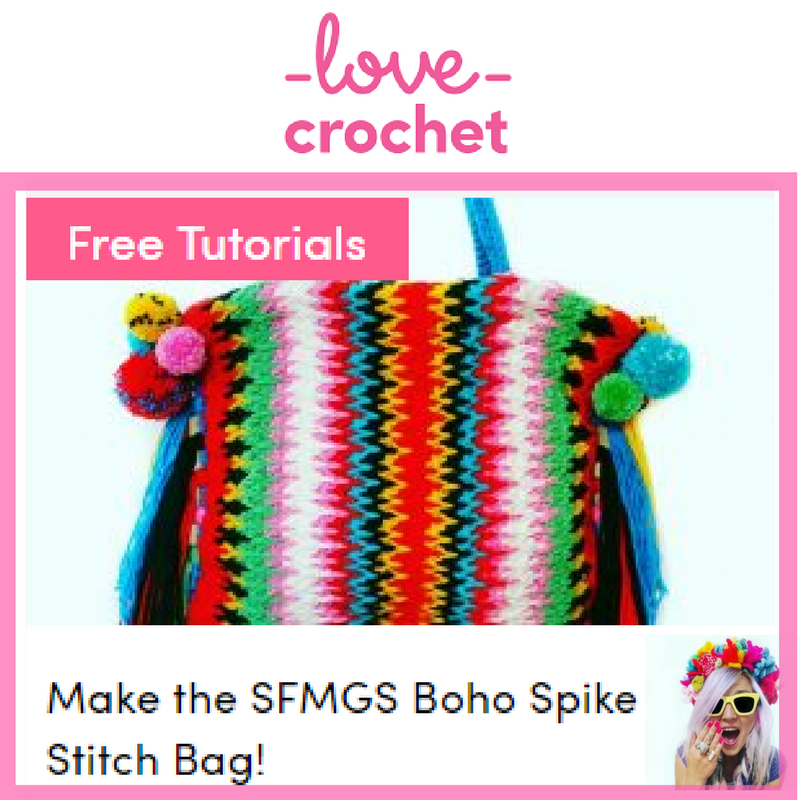 Skip 2 more spaces and make another 3 y/o puff stitch. Repeat this pattern around the work, join with slip stitch and cast off. Round 5: Cast on into any ch 2 loop space and ch 3 as 1st tc (US dc). Then tc (US dc), ch2, 2 tc (US dc) into the same space. Repeat 2 tc (US dc), ch 2, 2 tc (US dc) into each loop space around the work. Join with slip stitch and cast off. Round 6: Cast on into any ch 2 loop space from round 5, ch 1 as 1st dc (US sc). Ch3 and skip one space. Tc (US dc) into the next space between tc's and ch 3. Skip a space again and dc into the next ch 2 space. Repeat dc, ch 3, tc, ch 3 (US sc, ch 3, dc, ch 3) around the work. Join with slip stitch and cast off. Round 7: Cast on into any loop space and ch 3 as 1st tc (US dc). Make 2 tc (US dc) into the same space. 3 tc (US dc) into each loop space around the work. Join with slip stitch and cast off. Round 8: Cast on into any space between tc (US dc) clusters. Ch 3 as 1st tc (US dc). 2 tc (US dc) ito the same space. 3 tc (US dc) into each space between tc (US dc) clusters from Round 7. Join with slip stitch and cast off. Round 9: Cast on into any space between tc (US dc) clusters again. Ch 3 as 1st tc (US dc). Spike stitch down into the centre tc (US dc) stitch of Round 8. Tc (US dc) into the same space. Repeat around the work in each space between clusters. Join with slip stitch and cast off. Round 10; Cast on and ch 3, skip 2 spaces and make a 3 y/o puff stitch. ch3 and skip another 2 spaces. Make a dc (US sc) into the third. Repeat ch 3, 3 y/o puff stitch, ch 3, dc (US sc) around the work. Join with slip stitch but DO NOT cast off. Round 11: Ch 3 as 1st tc (US dc). TC (US dc) into the same loop space and ch 2. 2 more tc (US dc) into the same space. 2 tc (US dc) , ch 2, 2 tc (US dc) into each loop space around the work. 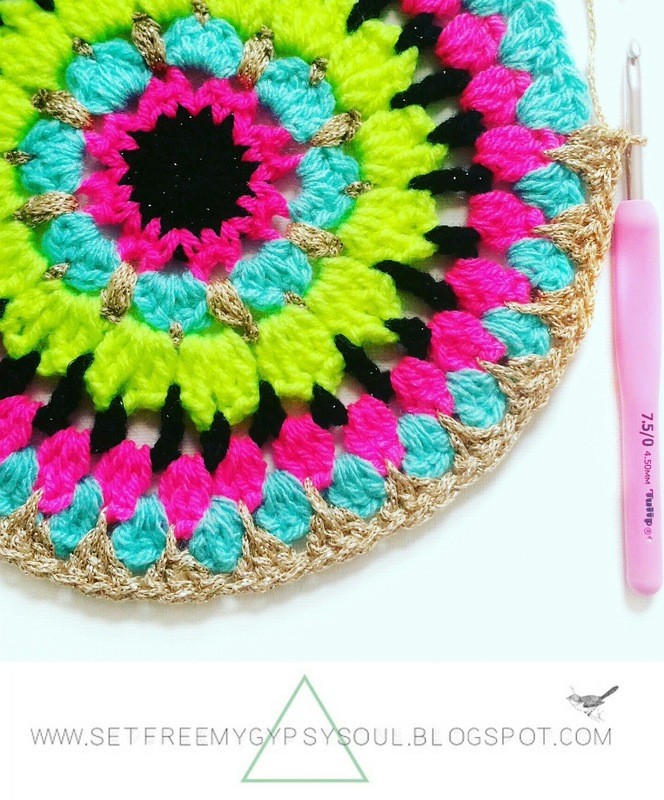 Join with slip stitch and cast off. 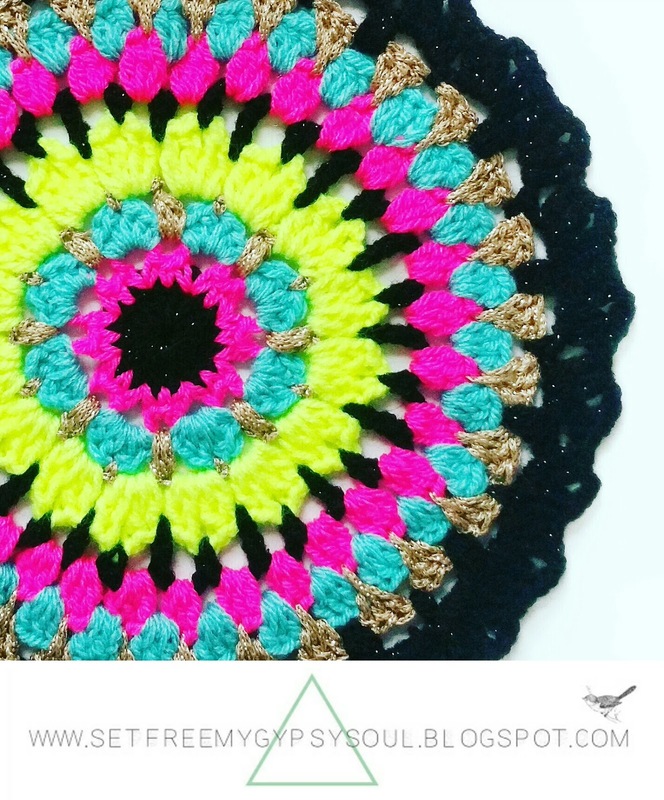 And don't forget to show me your version of the Confetti Merry-go-Round crochet mandala on Instagram by tagging me @setfreemygypsys0ul or using the hashtags #SFMGS or #confettimerrygoroundmandala.